Blurb: It′s 1939, and for Georg, son of an English academic living in Germany, life is full of cream cakes and loving parents. It is also a time when his teacher measures the pupils′ heads to see which of them have the most ′Aryan′- shaped heads. But when a university graduation ceremony turns into a pro-Nazi demonstration, Georg is smuggled out of Germany to war-torn London and then across enemy seas to Australia where he must forget his past and who he is in order to survive. 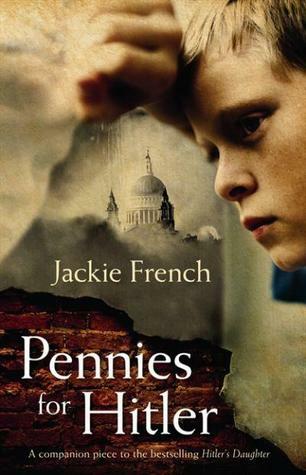 The companion book for HITLER′S DAUGHTER, PENNIES FOR HITLER examines the life of a child during World War 2, from a different perspective. Review: This book was read as part of a book club, though it also gave me a chance to do something I’d been meaning to do for a while, which was finally read a Jackie French book. I’d heard a lot of great things about her books, but I also wanted to read her because of the era in which she wrote both this novel and Hitler’s Daughter, which is, obviously, World War Two. 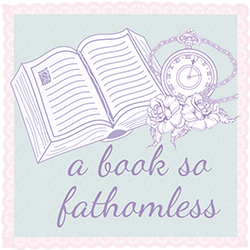 This particular era has always been a fascination of mine and I’ve read many novels, ranging from adult, young adult, middle grade, non-fiction, fiction etc. set in the 30’s and 40’s from all different perspectives so I had enough experience in this genre to create some comparisons between the books. The first couple of pages were quite enjoyable- I was looking forward to reading a book from the perspective of a young German boy, but that quickly disappeared when I read the university graduation ceremony mentioned in the blurb. For me, this is when the book seemed to get a little out of control. The events that were described in that scene might well have happened, but I think that the way it was all described made it seem like such a ridiculous idea. This is where my disappointed started. It got a bit better after this. I actually enjoyed reading about Georg’s time in London, there were a few things that got on my nerves a little, but all in all I really liked that particular part of the book. It was after this that things really started to go down for me- when I discovered that the rest of the book was going to be set in Australia. Don’t get me wrong, I love Australia and living here but I find books set in World War Two in Australia to be dreadfully dull, it’s essentially taking the reader away from the possibility of all the action in Europe at the time. A lot of the Australian part of the book still mentions the War, though more focusing on the fear of a Japanese invasion, I found myself losing interest of what was going to happen. The ending itself, in my opinion, was not very good at all. I didn’t hate it but I thought that it was sort of left to a bit of the readers interpretation, which I admit fits some books but in this case, I wanted a more solid ending. While I personally didn’t enjoy Pennies for Hitler, I can see why lots of people did- I just feel it didn’t quite meet my expectations.